The former are in for a hiding and many of them will not survive for obvious reasons….they will be seen as a “cost”. Value creators will survive and live to see another day! 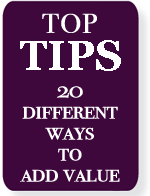 So how do you add value to an existing customer or key account? Firstly, your salespeople may need to change the wiring inside their heads. Our job is not to push the customer to buy more“. Our job is to improve our profitability and performance by helping the customer to improve their profitability and performance! We have to help increase their sales or help reduce costs……………..or both, of course! These days, all companies are in the financial services industry i.e. providing their customers and key accounts with increased profits! Give advice where they are low on know-how – remember that they are not really interested in learning about your business but they are interested in learning more about their own! Find solutions to problems they don’t (yet) know they have! Make them a hero – let them take the credit for your ideas – they will be keen to work with you again! Help them develop their plans for the future – how about an “away-day”? Be there quickly when they need you – drop everything! Understand their future strategy – become an expert in their world! Phil Jesson is the Academy’s Operations Director and is additionally involved in leading the way that speakers are selected, inducted and managed. Phil co-chairs Academy Group 42, Directors Forum 9 and Directors Forum 42 with Joanna Jesson and is very active in helping businesses to grow and thrive. Posted in: Adding Value, Business Performance, business support services.